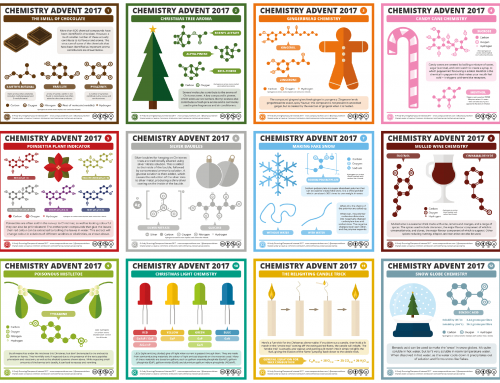 The aroma of pine trees is one that’s evocative of Christmas; one of the responsible molecules, alpha-pinene, has already been featured on the Chemistry Advent Calendar, but here we take a more detailed look at the chemical constituents of the aroma. 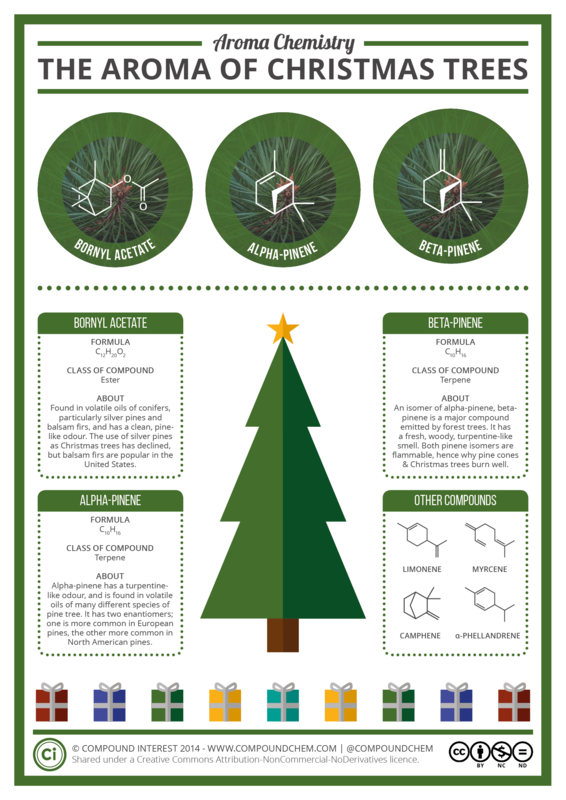 One of the most important contributors to the Christmas tree aroma is pinene. Pinene is a compound which occurs naturally as two different isomers: Alpha-pinene, and beta-pinene. In most pine trees, alpha-pinene is the more abundant of the two, but both are commonly present in the resin of the trees. Turpentine is obtained from the resin of trees, primarily pines, so it’s not surprise that the odour of both alpha and beta-pinene is commonly described as turpentine-like – they are, in fact, the major constituents of the distilled oil. Pinene belongs to a larger family of compounds known as terpenes. 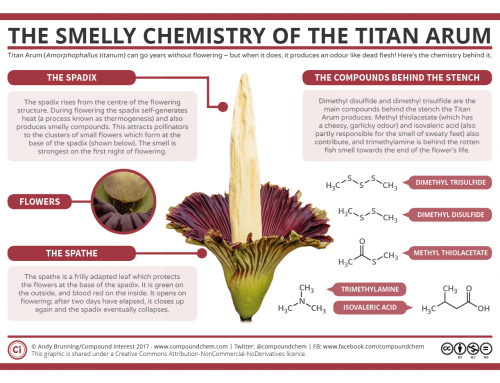 These are a huge range of organic compounds, commonly produced by plants. 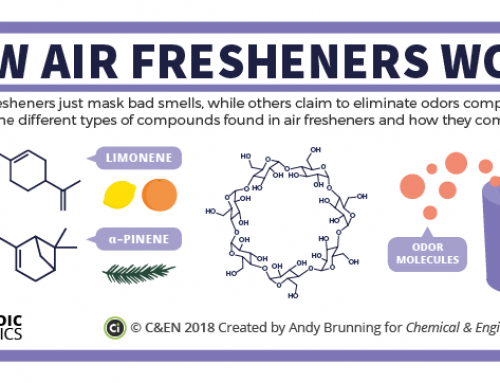 A range of different terpenes are released by various trees in forests, and these do more than simply providing the characteristic smells of the woods – scientists have discovered that the terpenes can react with some chemicals in the air to form small particles called aerosols. These aerosols can act as ‘seeds’ for clouds, allowing their formation from water vapour. Overall, the increased cloud cover can have a cooling effect. Terpenes are also responsible for the blue haze that is sometimes visible over pine-covered mountains. The aerosols that the terpenes form in the atmosphere can have a scattering effect on sunlight; this leads to shorter wavelengths of light coming to the fore, and the light taking on a blue appearance. Though the most abundant, pinene isn’t the only terpene amongst the volatile compounds given off by pine trees. There are also other minor constituents, such as limonene (also found in the peel of citrus fruits), myrcene, camphene, and phellandrene. 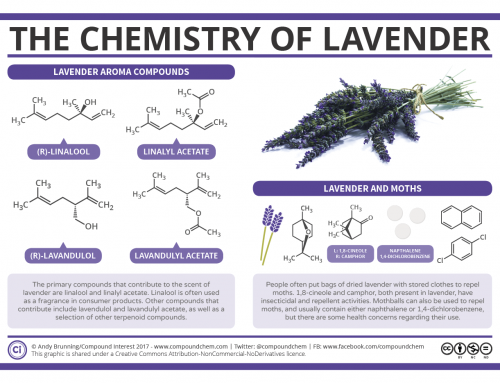 Additionally, other non-terpene compounds play a part in the aroma. Chief amongst these is bornyl acetate. Though its proportion in the volatile oils of pines varies from species to species, it contributes to the fresh, clean, pine odour. 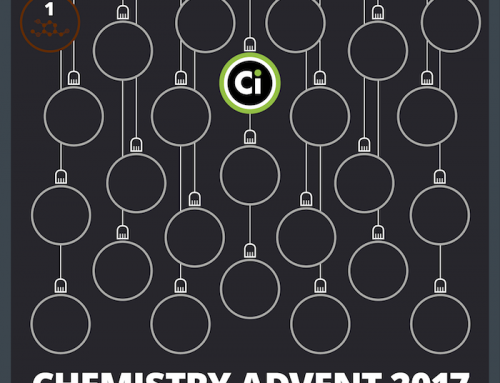 It’s also a commonly used compound to produce pine fragrances and air conditioners. It belongs to the family of chemical compounds known as esters, which generally offer a wide range of (mostly) pleasant smells. On a final note, if you’ve ever tried setting fire to a pine cone, you’ll have noticed that they’re pretty flammable. This too, is in part due to the chemical compounds we’ve discussed here. Pinene contains ten carbons and sixteen hydrogens, and this ratio means that it burns very easily; this is one of the reasons why forest fires can spread very quickly.